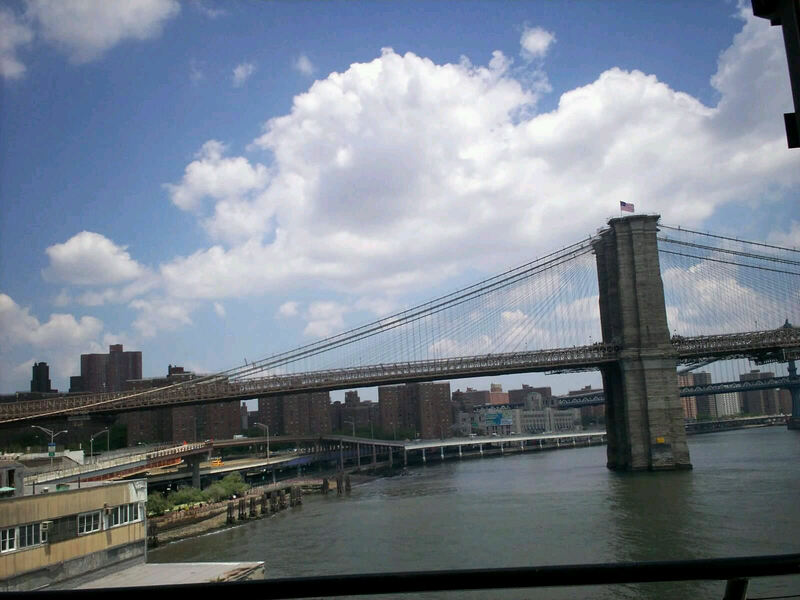 Our 2011 Road Trip #13: The Brooklyn Bridge and Enough Gold to Buy It « Midlife Crisis Crossover! To learn more about the Brooklyn Bridge, MCC recommends you check out David McCullough’s The Great Bridge: The Epic Story of the Brooklyn Bridge. I’d loan you my wife’s copy if you lived nearby and we thought you could be trusted. The World Trade Center Visitors Center offered more emotions to explore and lessons to impart, but we had to skip their basement displays because we had an appointment to keep. 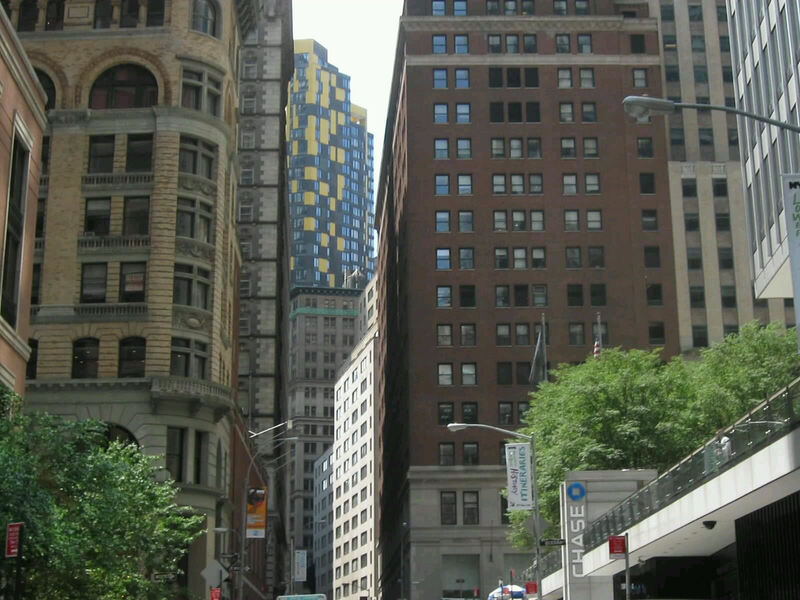 The walk down Liberty Street, as with numerous other neighboring streets, was made of claustrophobia. I can’t imagine Storm of the X-Men flying through some of those passages without hyperventilating. We had an appointment for an 11:30 free tour of the Federal Reserve. I decided that a few short minutes before our arrival was the absolute perfect time to tell Anne that, while we were on the subway earlier that morning, I remembered that the “Bring a copy of this email with you for admission” email that she printed and entrusted in my care was perfectly safe and sound in my suitcase back in our New Jersey hotel. She demonstrated her unconditional love for me by keeping my vengeful grisly demise tucked away securely in her imagination rather than acting on that impulse in front of the nice Federal Reserve security guards. I surmised that our names would be on an organized admission list anyway. 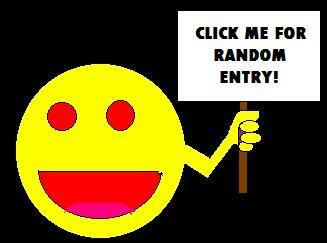 To this day I’m grateful to God for allowing that feeling to be a correct hunch instead of a called bluff. They checked their clipboard, we showed our ID, and we were in. This isn’t the Federal Reserve, just some nearby random buildings. I bet at least one of them has cool things inside, such as public restrooms. The Federal Reserve is another hot spot that doesn’t permit photos for purposes of national security and effective hoarding. Average tourists like us were the minority of our group, which was more heavily peopled by men of multiple nationalities dressed to the nines in suits and accessories that likely cost more than our household’s monthly income. I think we were the only visitors who weren’t on the clock and slotting this tour into their virtual day planner as a business meeting. The first several lengths of it are just coin-collecting displays, international and ancient alongside the new and homegrown. For the average numismatist, this would be Shangri-La. The real draw for the undiscerning Average Joe is the armored sub-sub-sub-sub-sub-sub-sub-subbasement, where we were escorted and privileged to lay eyes upon $335 billion in gold bars, a substantial collection of importance to numerous anonymous depositors of no small stature. We weren’t allowed to touch, only stare and stare and scheme. STARE. I meant stare. The gold bars were pretty and heavy (28 pounds each), but the steel bars were formidable and eminently surrounding. When we resurfaced after the tour, we were instead permitted to take all the free souvenir writing utensils and mimeographed coloring books that we cared to carry, which was almost none. 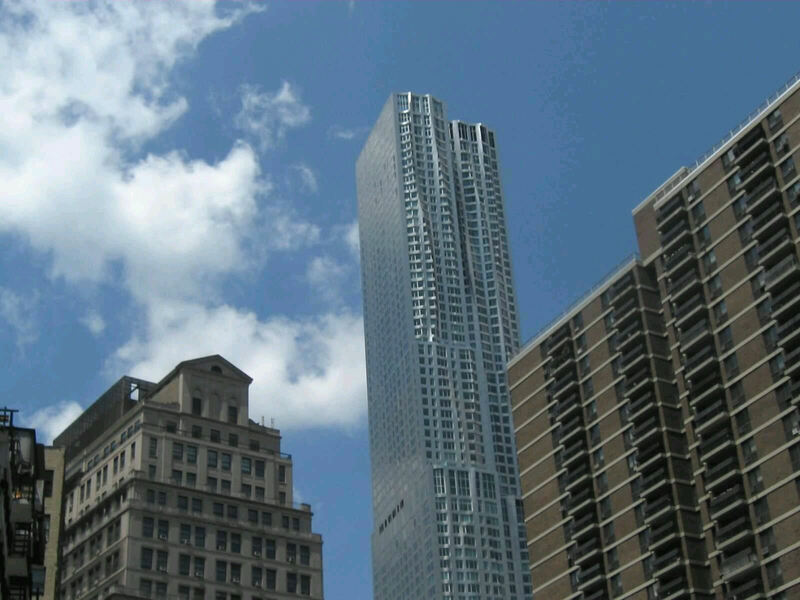 Niftiest random building shot of the day starred 8 Spruce Street, nearly completed. The first five floors will be a public school, opening in September; the rest will presumably be mixed-use. It looks like the entire building was crammed inside a Chinese finger-trap and given a hard twist by Galactus in time for the grand opening. 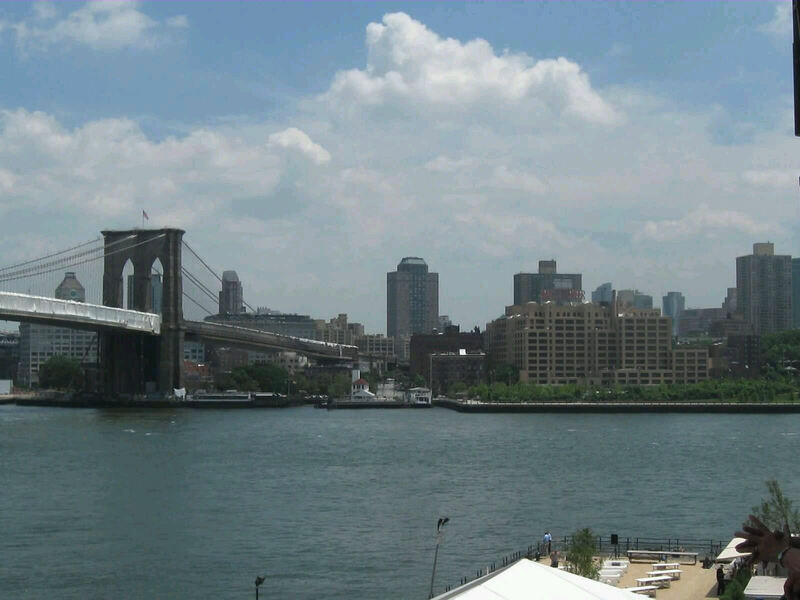 Several blocks due east from the Federal Reserve was the South Street Seaport, whose selling point was its competitive vantage point for gazing upon the Brooklyn Bridge, and on the nearby docks. …and deposit you in scenic Brooklyn. 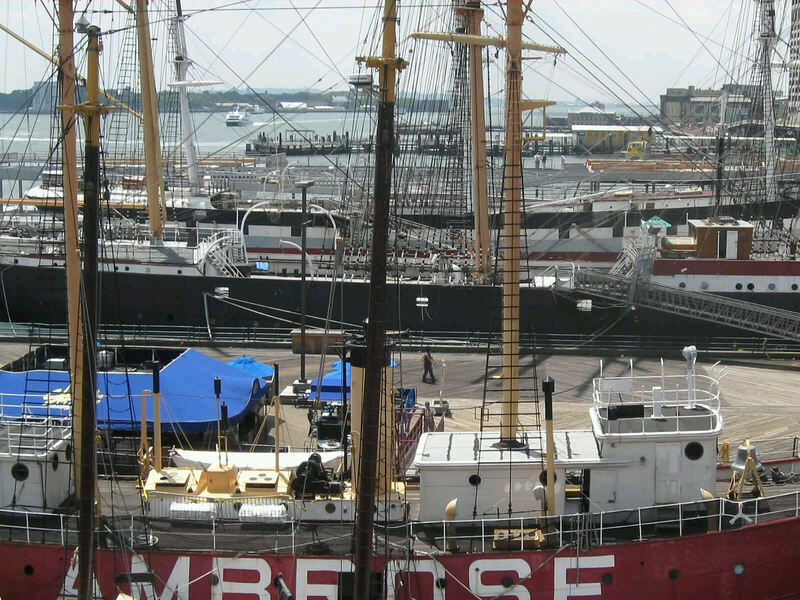 Between Wall Street and Brooklyn stands a working class armada. It’s not exactly like Chicago’s Navy Pier, where young people with clipboards try wrangling you into an overpriced cruise. If only. Our view on the way to the boats wasn’t the most scenic. 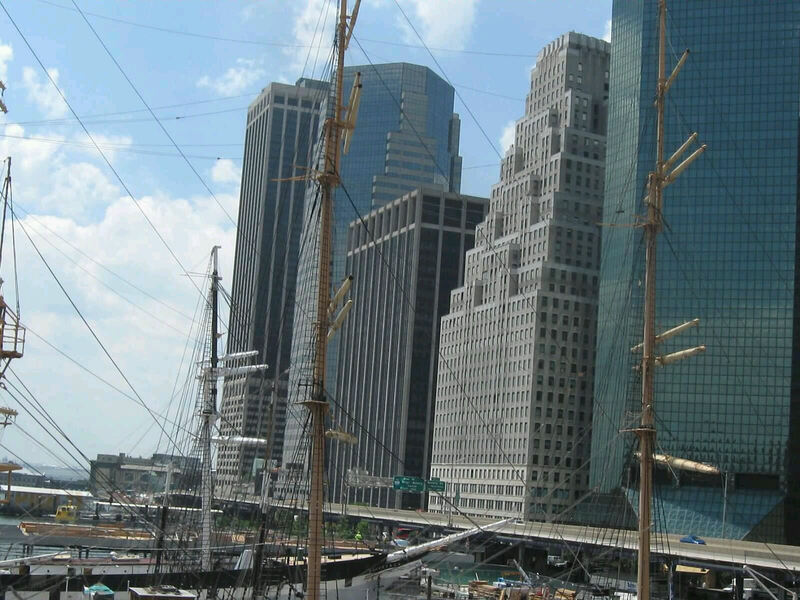 The South Street Seaport is otherwise any old mall. The midday sun and the cumulative walk from the 9/11 reconstruction to the Seaport had us drained enough that we were in no condition to turn up our noses at the third-floor food court. Anne had herself a genuine Nathan’s Hot Dog, while the boy and I settled for scoops-of-meat-on-rice joint #429, here named China Max, a Chinese phrase which means “exTREEEME Chinese” in some white marketing guy’s dream. He and I had dearly hoped to hold off on lunch till we were elsewhere, but by this time he was dehydrated and I wasn’t in a position to allow either of us to be picky. 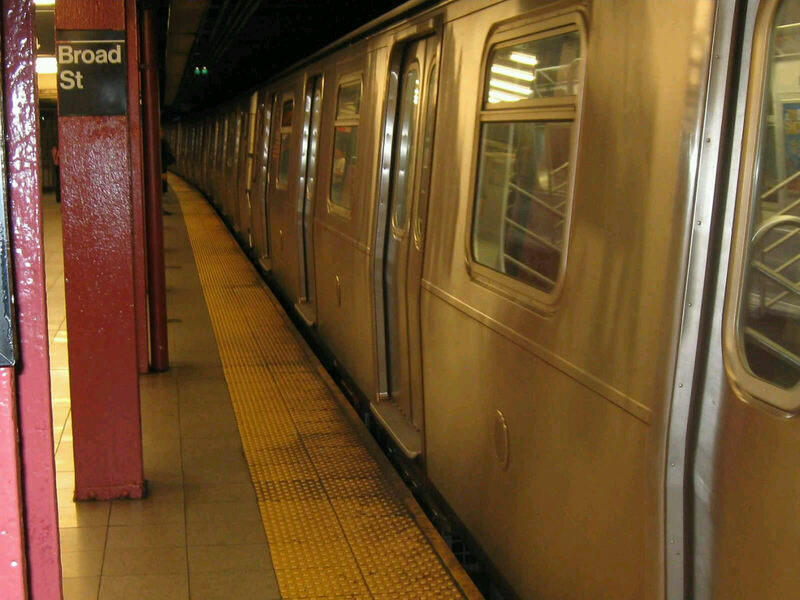 After our vacation I used to tell people I wanted a subway connecting Indianapolis and NYC. Still waiting, bureaucrats. …and accidentally took the J train one block south — not only the wrong direction, but to the end of the line. Neither we nor the blond iPod-grafted lady across from, the only other passenger aboard, were paying heed to much of anything around us till a burly MTA guard rapped a nightstick on the windows and shattered our obliviousness. We disembarked, walked up a flight, crossed over, walked down a flight, waited a couple more minutes, then took the next train heading the other way, north into the wonderful world of Chinatown. 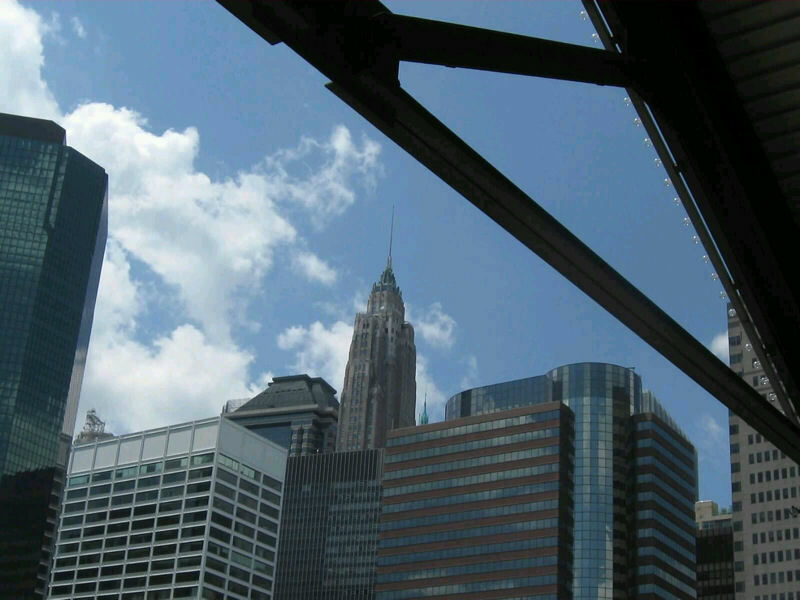 Years ago I used Microsoft Photo Stitch to staple together a few of our pics to create our own complete Brooklyn Bridge mega-photo that looks bent in the middle like an old plastic Hot Wheels track. It was worth a shot. 1. 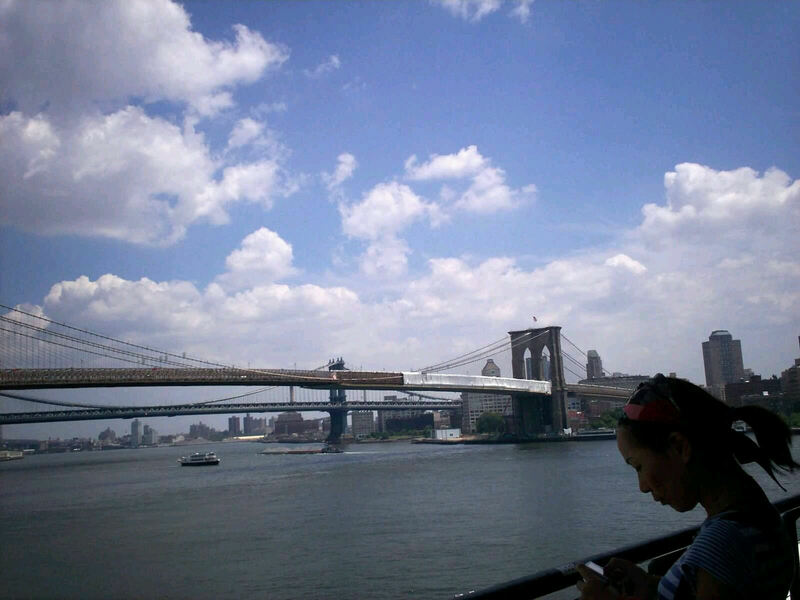 Anne regrets we never stepped foot on the Brooklyn Bridge this trip. Hoping to rectify that oversight soon. 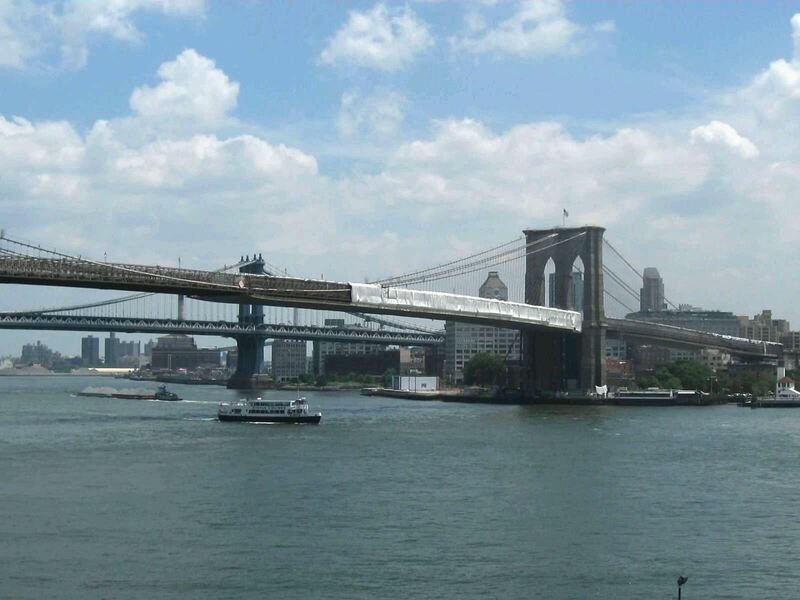 In my defense, it was hot and the Bridge was waaaaaaaaaaaaaaaaaay over there.